When shopping on RestauriRaia.com, your payment is totally secure because managed using an encryption protocol SSL certificate data. RestauriRaia.com has not at any time access to sensitive data of selected payment systems. We accept all major credit cards, including prepaid, part of circuits: Visa, Mastercard, American Express and Visa Electron. Arrived to step Payment, select the “Credit Card” option and click on “Make Order”. When ordering, cash is ONLY on the card. The actual payment, and then charge your card, will only take place when the order and taking delivery by the courier. 1. Arrived at the step of Payment, select PayPal and click Proceed to PayPal. 2. You will be redirected to PayPal, please login with your account email and PayPal password. 3. Complete the payment by clicking on Pay. 1. Arriving on the payment step, select Bank Transfer and click Place your order. 2. You will receive an e-mail confirming the order is created where you will find all the information to make the transfer. 3. Make the bank transfer by entering the order number as a REASON. 4. Send the receipt of bank transfer by following the steps in the e-mail confirming the order is created. 5. It ‘important that you make the transfer, and that we should send a receipt as soon as possible, confirming the order at depots in fact, occurs only after this step. 6. After making the necessary checks, we will ship the products you ordered. 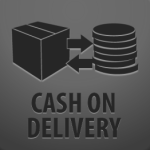 Cash on delivery is possible only for local. 1. Arriving on the payment step, select Payment on delivery.